Oakland, California based artist and educator, Lauren Hartman‘s artwork responds to current topics, which serves as a record in our cultural conscience. She received an MFA in Painting from San Francisco Art Institute in 2010 and a BFA in Printmaking from Columbus College of Art and Design. Select exhibition locations include Yerba Buena Center for the Arts, Kala Art Institute, and SACI in Firenze Italy. One of her most recent projects, the Society of Submerged Culture, was in residence at StoreFrontLab in San Francisco. She teaches textiles to both adults and children, digital storytelling to adults with special needs, and hosts community art workshops including diorama fabrication and artifact creation. Lauren Hartman: I grew up in Atlanta Georgia. In the summers I spent lots of time swimming, collecting shells, and spending time with my large extended family at the beach in Ocean City, New Jersey. This is where my love of the sea began. I was a mixed media printmaker at Columbus College of Art and Design. I focused primarily on silk-screening on fabric, and would work back into the image with embroidery. 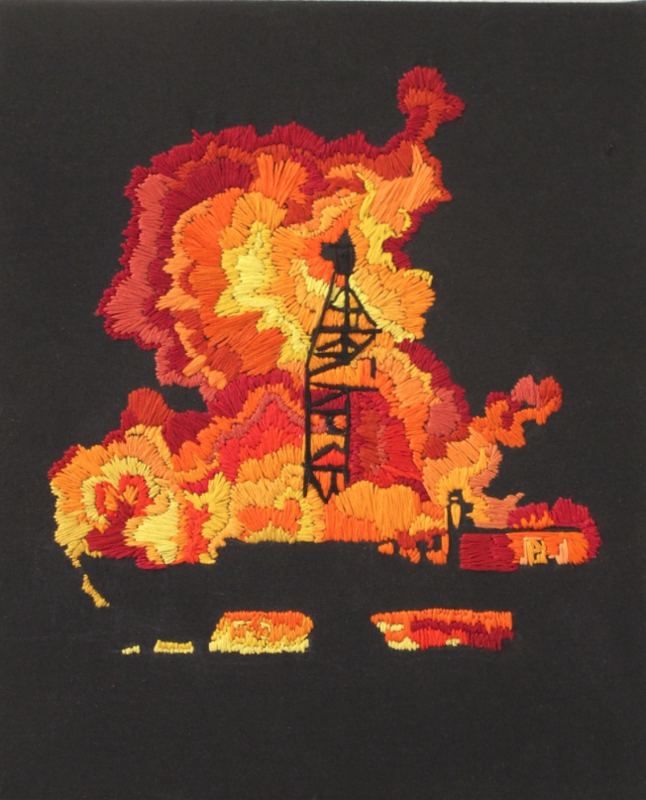 After college I lived in NYC, where I focused more on embroidery and painting. Space and facilities were limited and I found embroidery to be really relaxing and meditative amidst the energy of the city. This is really where my interests in maritime culture, and the highway of the sea began to form. D: How did the concept of Traces of the Arctic progress? 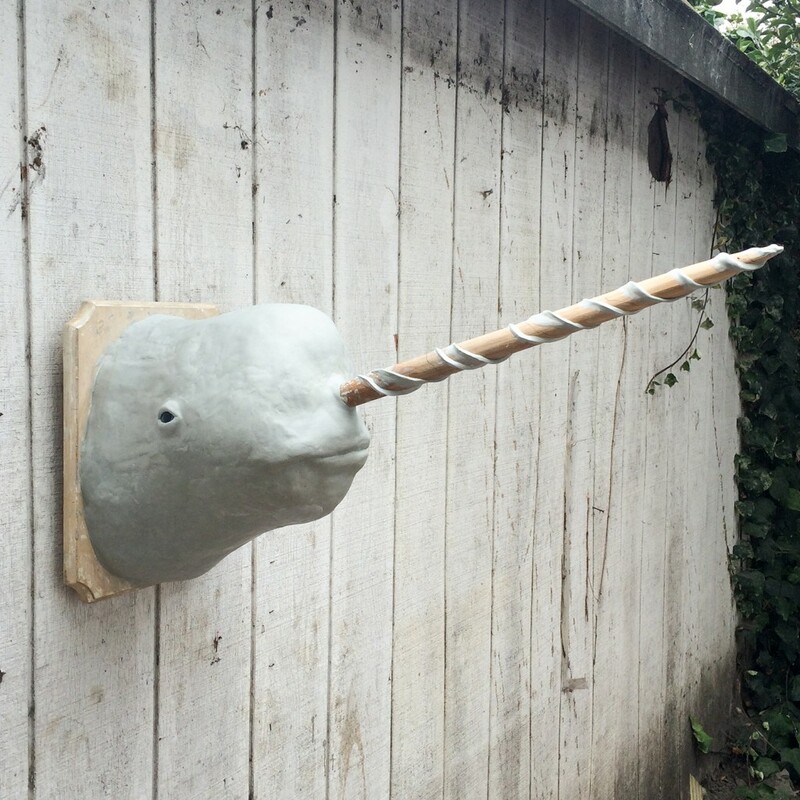 LH: I had been reading the book Narwhals by Todd McLeish. This book helped inform me about their habitat, scientific studies, and the complicated fishing practices of the narwhal. They are such magical and mysterious creatures! I’ve spent time looking closely at photos of them and their facial and dental structure. Male narwhals’ tusks are actually their left canine tooth. Sometimes the right canine will develop and the narwhale will have double tusks. I have also been watching tons of documentaries about the Arctic and following international news about the many countries laying claim to the region and the shipping routes. D: Your work comes to us right after the protests in Seattle and Portland against Shell’s drilling in the Arctic, have you been following this? LH: Yes! Icebergs and the Arctic have woven their way through my work for many years. Lately, the controversy around drilling and shipping lanes in the Arctic ignited my focus again. Locally, there have been many protests at the ports, aiming to stop Shell’s drilling in the Arctic. I understand its human nature to explore and conquer far-off lands, collect and exploit natural resources, pushing the boundaries of nature. Eventually nature fights back, but not unscathed. I think it is denial to think global warming is not partially a result of humans’ energy production, expansion, and natural resource extraction. Now we have better documentation devices and research studies to measure our impact on nature. With the warming of the Arctic, sea ice has been receding and melting like never before, clearing a path that icebreakers can chisel through. As a result shipping lanes can now be routed through the Arctic during the summer months. Many countries bordering the Arctic have been increasing production of icebreakers and strengthening their fleets; impacting the wildlife and geography of the region. I think it is wonderful when people take their argument and protest to the sea. It made me feel good that someone was protesting the huge impact drilling will have on the Arctic… and pushing back. D: Do you feel a responsibility as an artist to include social commentary in your work? LH: I do feel a responsibility to include social commentary, but intend to raise questions, not just formulate a static statement. Art allows a level of re-interpretation, and can lead to questions rather than answers, which I find useful. D: How do you choose which environmental issues you focus on? LH: For the last 7 years my work has been focused on issues of conflict at sea. I have been investigating the interaction and impact people have on the sea. One year I followed and documented international shipwrecks in inlaid mother of pearl, silver/gold leaf and watercolor. At the time, the world’s economy was very turbulent and financial organizations and stock markets seemed like sinking ships. Then, after following the media coverage and reports of stressful attempts to stop the Deep Water Horizon leak, I was motivated to explore that further. The explosions and leaks have left a trail of irreversible damage to the ecology. Lives were lost, and coastal economies ruined. The mass scale of these disasters mesmerized me. People have referred to my recent work as “disaster paintings”. Strangely, I did not think of them as disaster pieces while I was working on them. While I sew, I usually listen to stories or films about the sea, which can be a distraction from the sensitive and multifaceted disaster that I carefully render in thread. D: What drew you to the images of the Arctic? LH: I was ready to move away from disasters at sea and investigate the landscape. The Arctic landscape is so beautiful to me. The severe conditions and glacial landscape are a fascination. Photographs of the Arctic appear so calm, quiet, and peaceful but in actuality it’s a brutal environment. D: Does Oakland and the West Coast affect the subject matter you focus on? LH: In graduate school at the San Francisco Art Institute, most of my work focused on the sea. My studio window was along the San Francisco Bay. I spent a lot of time looking out the window. The huge ships that passed were really inspirational and drew my practice to looking at the sea. The Oakland port is one of the largest ports along the West coast. The port is an expansive landscape of cranes, massive ships, and colorful containers holding many of the imports that will soon be on the shelves. Each time you take public transportation or drive over the Bay Bridge leading to San Francisco, you have an overhead view of the port. I take this round trip at least 5 times a week and I am glued to the window each time. The grand scale and expanse of the shipping industry is a huge inspiration. 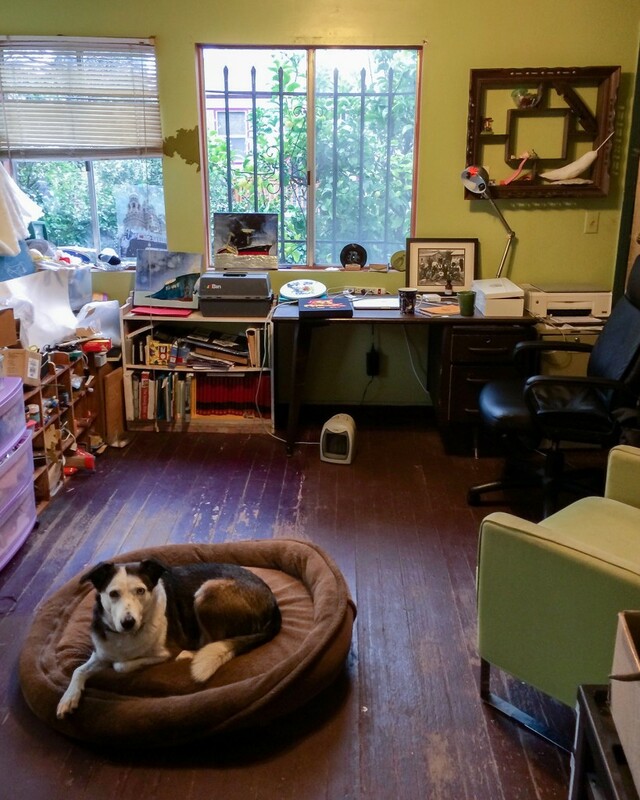 LH: My studio space is in my house; I like to have the accessibility to work on things anytime. Usually, I sew in our living room, but I have always liked to have a little place carved out for a studio in my home. I am super lucky to have a backyard to work on large sculptures in and make a mess. LH: When I begin a new body of work I spend a lot of time researching my subject matter and combing through photo-documentation of it. Once I have a photo to work from, I use it as a guide to inform the line work, fabric, and color pallet of the piece. My next step is to choose a fabric that conceptually works with the photograph or imagery. 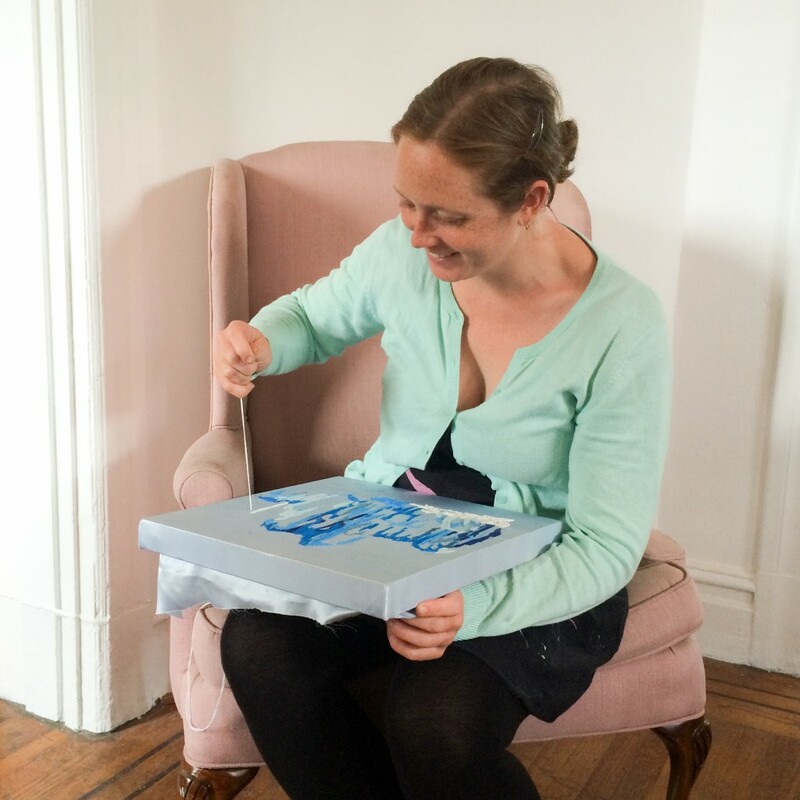 LH: My embroidery works have a tenancy to be on a smaller scale. In this body of work I rendered the expansive landscapes in small delicate stitches. The tight stitches focus on the details of the landscape. The concentration of the stitches allows for the work to be studied up close. D: Do you work on multiple pieces simultaneously? LH: Yes, especially when I am working on a body of work surrounding a specific subject matter. It is important for the pieces to have a dialogue with one another. I also like to work in many different mediums, I find this to be very stimulating and it helps me switch up my practice. D: What draws you to embroidery and how did you learn to embroider? LH: My mom taught me to hand sew when I was very young. From there I started using the thread as a drawing tool rendering lines with thread. Embroidering is my favorite thing to do. I am drawn to the fine delicate line work and meditative focus it requires. It is also a very portable medium. When I travel I will often bring along a small embroidery I can fit into my suitcase to work on. I can pick it up and work on it anytime of the day and don’t need a lot of space or supplies to do so. Since I was a little girl, sewing has been the process I always come back to and feel the most comfortable doing. It is a pretty forgivable medium if you make a mistake you just cut it out.